An easy stroll into the deep primeval woods of our region. Mediation, ritual, contemplation and community. 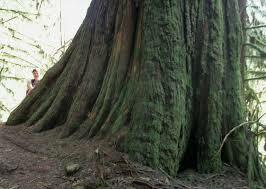 Join sangha for a Zen experience in the Old Growth forest remnant off of Mount Baker Highway. Parking is limited to 2 or 3 spots and carpooling is essential. Meet at the Dharma Hall at 9:00am, or at the grocery store in Nugent's Corner at 9:30am. We'll return to the Dharma Hall at about 2:00pm. The program includes silent exploration of the Old Growth, meditation, and a ceremony of gratitude to nature. To extend the practice day consider arriving for the 6am - 9am Saturday morning practice at the Dharma Hall which, as it's the first Saturday of the month, includes potluck breakfast. To come on this hike please RSVP with the registration form. Click the "Register" button to the left to start the process. There will be an opportunity during registration to make a dana offering if you choose (details on Dana Paramita here) and you may also make a dana offering at any time on the Dana page. Unlike our "indoor" retreats dana is not generally collected during the event.